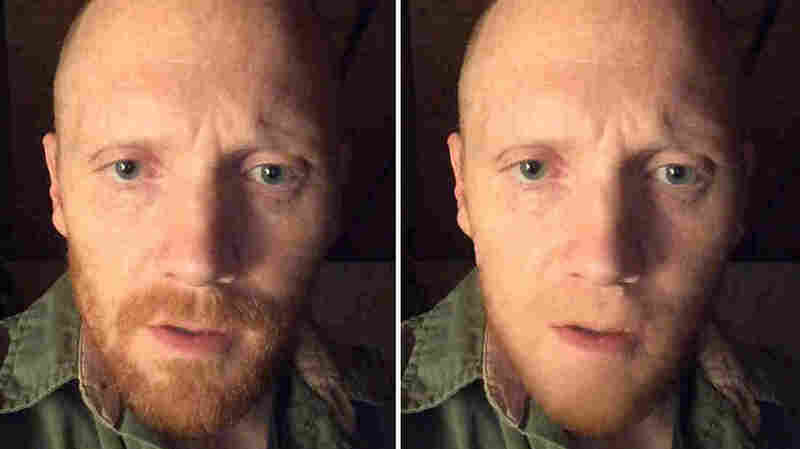 Suspect In Shooting Spree Near Philadelphia Has Been Found Dead : The Two-Way Police have found the body of Bradley Stone, who they say went on a shooting rampage that killed his ex-wife and five of her relatives in Montgomery County, Pa., Monday. 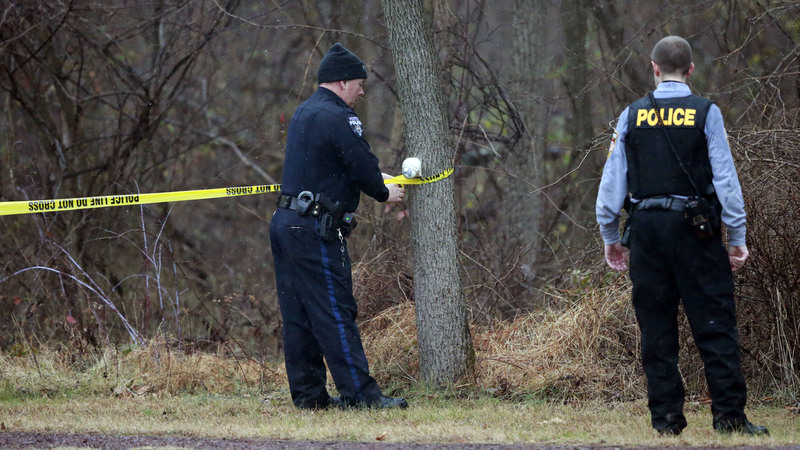 Police cordon off a wooded area during the search for suspect Bradley William Stone in Pennsburg, Pa., Tuesday. Bradley Stone, who police say went on a shooting rampage that killed six people in Montgomery County, Pa., has been found dead. Police had been looking for Stone, 35, for more than 24 hours; they found his body today. "Authorities have confirmed that suspected mass killer Bradley Stone is dead, his body found in the woods near his Pennsburg home." The confirmation comes after ABC 6 TV news reported that a body had been found, adding, "Sources say Stone is believed to have killed himself. He was found dead on his knees hunched over wearing sand color camouflage." District Attorney Risa Vetri Ferman has provided more details in the case, in a news conference Tuesday afternoon. When police found his body, the DA says, Stone had killed himself with a large knife. She added that he had wounded himself "in the center of his body." We'll note that local media, citing sources in law enforcement, say the weapon may have been a sword. Vetri Ferman said that several of Stone's victims had suffered cutting wounds in addition to being shot. The district attorney also said that while the shocking violence has stunned a community she described as family-oriented and peaceful, she commended its residents for how they've handled the situation. Answering a reporter's question, Vetri Ferman said no note was found near Stone's body. But local TV NBC 10 says Stone had recorded a video on his cellphone, which was found at the scene. She also said that a clear motive has not emerged in the case. "There's no excuse... there's no valid explanation for snuffing out these six innocent lives," she said. Acknowledging the tragic killings' effect on law enforcement, she said, "We're really numb from what we've had to deal with." The hunt for Stone had set the area around his home northwest of Philadelphia on edge; schools were closed today, and many public places operated under tight security. Stone, 35, was found dead in Pennsburg, Pa., one day after police say he went on a killing spree that left his ex-wife and five of her relatives dead. To aid in the search for Stone, police handed out a photo taken from his phone (left), which was digitally altered to show how he might look shaven. Stone is suspected of killing his ex-wife in the early hours of Monday, and then taking their two daughters and leaving them at another location (they were reportedly safe). He also visited two other homes, where he shot and killed five more people. "Neighbors of Nicole Hill, the ex-wife of Stone who was the last person killed, told WHYY that she was scared he would kill her. 'She would tell anybody who would listen that he was going to kill her and that she was really afraid for her life,' neighbor Evan Weron said. "A neighbor of Hill's mother, who was also killed on Monday, told the Philadelphia Inquirer the couple had a very volatile relationship. 'He was a great guy and an excellent father," Lisa Andrey said. 'And then he went away to Iraq and came back and was a completely different man.' "
In three separate attacks before daylight Monday, Stone is believed to have killed Hill's mother, grandmother, sister, brother-in-law and niece, leaving her nephew, 17, seriously wounded. The order of events has been reported in different configurations; investigators now say they believe the attacks ended with Hill's death. After his divorce from Hill, Stone had remarried; the authorities have been holding his wife and their infant son in protective custody, along with Stone and Hill's two daughters. According to ABC 6, "His wife's Facebook page shows their son and Stone's daughters having their picture taken with Santa on Saturday."